Its my first time to post a recipe for the Food Blogger Recipe Swap. I’ve always been interested in trying out recipes from other bloggers blogs. I wanted to join the Secret Recipe Club but it shut down. I came across this group by chance and requested Amber Dawn who blogs at Simply Made recipes to enroll me as a member. My first post and I’m a bit late but then better late than never. The other participants posted their recipes before Thanksgiving Day. How does this group work? Well, its quite simple. Every month (except during holiday time), Amber will ask who would like to participate in the event for that particular month. We add our names and she pairs us up. We then visit our partner’s blog and make something from there in our own way, style and post it on our blogs and linking it to the original recipe. Luca lives in California (that’s so far from Mombasa!). She works in the Fashion Industry. I must admit I’m not much into following the latest fashion, but we have one common factor and that is cooking. Luca started her blog when she was in between graduation and starting her present job. She learnt cooking from her mum and is also a self taught cook. When I was going through her blog and trying to decide what to make, I was quite intrigued by her Egg White and Oat Garlic Pizza Crust. I noted down a reminder that I’d make this but then cute little pumpkins that I bought from the vegetable vendor who comes to our apartment regularly, beckoned me to look for a pumpkin recipe. I came across her pumpkin banana bread muffins and I knew I had to try this recipe out. Cute pumpkins and over ripe bananas sealed the deal. Do take some time to check out Simply Delish Eats… the recipes are simple and delish. From healthy recipes, to desserts most of the photos will make you drool. I have made a few changes to the original recipe, I used a combination of wheat and all purpose flour. I also used brown sugar, dried cranberries and pumpkin pie spice. My daughter ( who also works for the fashion industry) took them to work to share with her friends/colleagues. They loved the muffins. They came out soft and full of flavor. Luca thank you so much for sharing a delicious recipe. Check out my version of the pumpkin banana bread muffins. Prepare a muffin tray. Either put muffin liners or grease it with some oil or butter. Sift the flours, salt, pumpkin pie spice, baking powder, baking soda together in a big bowl. Add sugar and cranberries. Mix well. Mash the banana to make a puree. Add the pureed banana to a measuring cup. Add pumpkin puree to make it up to 1 cup. Whisk the puree, oil, eggs and water together in a separate bowl. Add the whisked liquid to the flour mixture. Mix just enough to wet the flour. Pour the batter into the prepared muffin tray. Fill each cup ¾ of the way. Bake for 20-25 minutes or till the muffins become golden brown. To check if they are done, insert a toothpick in the middle of one muffin. If the stick comes out clean then the muffins are done. Let them cool for a while on a wire rack. Serve with some hot coffee or tea. To make pumpkin puree at home, cut the pumpkin into half (if its small) or into quarters for larger one. Roast it in the oven at 180°C for 30 -35 minutes. Scoop out the pulp and puree it in a food processor. To make pumpkin pie spice at home simply mix 2 tsp cinnamon powder, ½ tsp ginger powder, ¼ tsp clove powder and ¼ tsp nutmeg powder. Add raisins instead of cranberries. 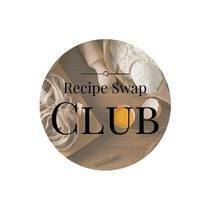 I used to be a member of the secret recipe club and was with them for almost three years .I loved being a member so I am going to ask if I can join this group. Your muffins sound delicious and perfectly baked.They would make a really good tea time treat. I love the pumpkin bread muffins.. They taste so good. This is the only way I can make hubby dear eat pumpkin. Such a lovely recipe swap group Mayuri. So much to learn from each others work and make friends from all over the world. The blogging platform really has its own benefits I must say. So much to learn, so much to cook and blog. 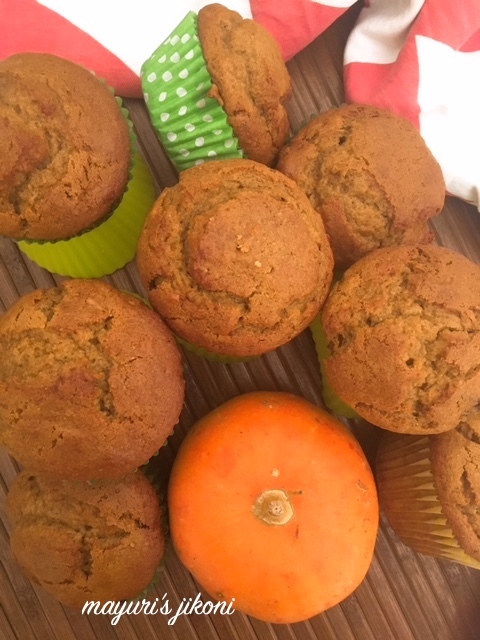 Loved the muffins and I can imagine the softness or moistness from the pumpkin combined with the bananas. This looks so delicious and a good way to feed kids the pumpkin….